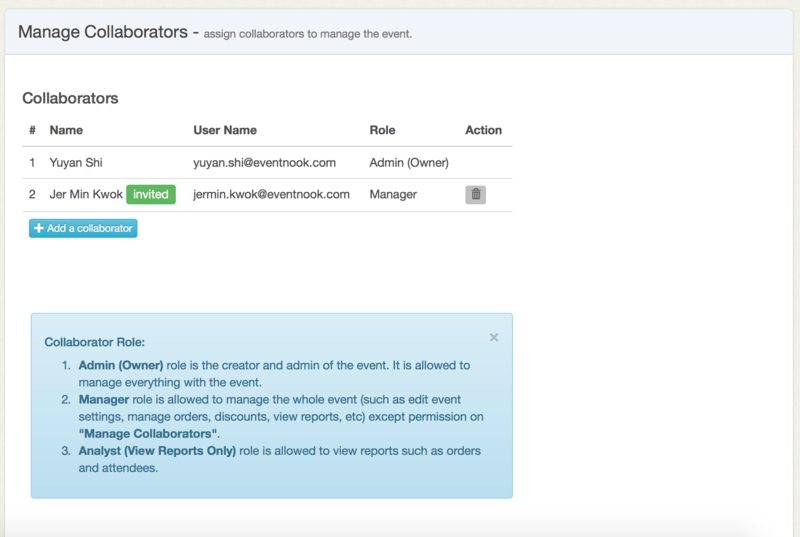 EventNook now allows multi-users access to support team collaboration. The owner (admin) of the event can invite to other collaborators (users) to have access the event data, edit the event, manage registrations, manage discount codes, view reports, etc. Under the selected event dashboard, Go to Setup >> User Access. For the sake of simplicity, there are 2 user roles (Manager and Analyst) provided which are to be assigned for collaborators. 1. Manager role is allowed to manage the whole event (such as edit event settings, manage orders, discounts, view reports, etc) except permission on “Manage Collaborators”. 2. Analyst (View Reports Only) role is allowed to view reports such as orders and attendees. If you have any feedbacks or questions, feel free to drop the note to hello@eventnook.com. Check out our overview page to know more about EventNook as an online event registration and ticketing platform!